When using a metes and bounds survey, it might be difficult to find a parcel’s borders. Metes and bounds is a method of surveying land that is centuries old. It was the principle way to measure land before the Land Act of 1785, so much of the land in the original 13 colonies was measured this way, as well as in Kentucky, Tennessee, West Virginia, and Texas. Before technology, or even before sophisticated measuring instruments, land surveying was fairly imprecise. The plots could be large, often encompassing many acres of farmland or heavily forested areas. Parcels were often defined by formations such as rivers, trees, roads, or other landmarks. Of course, trees eventually die, rivers can erode land, and roads can be moved. Worse, when no obvious marker or indicator was present, a pole or stake may have been driven into the ground to mark the boundary. These can fall over on their own, or malicious neighbors can intentionally move them. According to SurveyHistory.com, compasses, which are not always a 100 percent reliable indicator of direction, were often used in these surveys as well. Land was described as starting at a certain point and continuing in a line based on the compass needle. Thus, considering the impreciseness of these tools and descriptions, numerous lawsuits have been filed over the years disputing the borders in states that used metes and bounds. What, Specifically, Are Metes and Bounds? Metes are distances between two points measured with straight lines, regardless of what is in between them. Bounds are less specific. They may appear in a description as a building, rock, or other nonpermanent marker. When using this method to survey land, the description directs the surveyor to start at a certain point. This may be at an intersection of roads, a particular point on a stream or something even more nebulous. From this point, the surveyor follows the compass needle for a specified number of feet, until reaching another point, be it a physical marker, tree, or rock. LegalDictionary.net says that now, photographs often accompany these loosely measured parcels in order to more definitely define the borders. Even images using technology as simple as MapQuest can help to more precisely mark a parcel of land that would otherwise be defined by measuring tools and compasses. Photographs and maps can help identify the boundaries described in a metes and bounds survey. 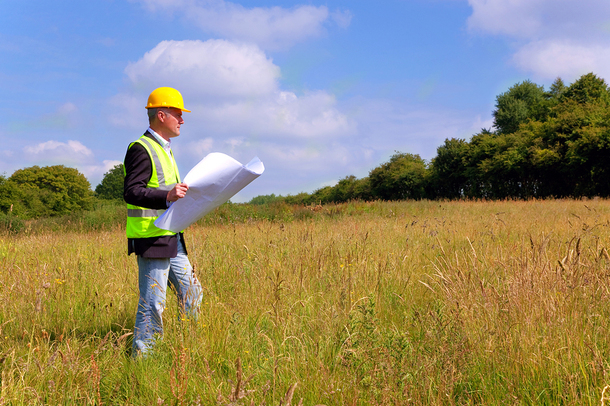 If you must survey a plot of land that originally used metes and bounds, it is best to try to follow the directions included in the original survey. If all the markers are still present, you can use modern technology to improve the survey and make it more precise. However, the less precise the original survey, or in cases in which the markers are no longer present, surveying the property can be difficult. LegalDictionary.net mentions a case in which a piece of property was poorly described by a surveyor using terms such as “more or less.” The property was surveyed three times over a period of years and each survey yielded markedly different boundaries. A lawsuit was filed. In the end, the jury sided with a surveyor who said that although the original survey had unclear borders, it described a set number of acres and that this should be the determining factor in establishing borders. Not every metes and bounds survey ends in a lawsuit, but it’s easy to see how some do. With these types of surveys, you can only make the most accurate determination from the information you have and the tools you have to work with. PDH Academy courses on topics such as Specifications for Descriptions of Land can help you fulfill your professional development hours. Check out our PDH approved courses today.